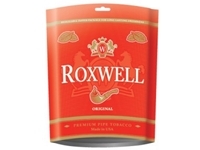 Roxwell Pipe Tobacco is perfect for enhancing and improving nearly every blend you can think of. Enjoy a awesome combination of natural flavors and a smooth tobacco taste. A blend of high quality tobacco, expertly selected from the best regions, cured and blended by artisans to provide a sensory delight. Outstanding Quality, Superior Price, Right Choice.